If you are running Google Chrome you might have noticed that it takes forever to Clear Browsing Data (CTRL+Shift+Del) from the beginning of time. It happens especially when you are running an old installation of Google Chrome, or you have a great amount of Extensions and Plugins running in background. 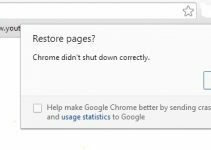 I encountered the same problem a while back, Chrome took forever to clear browsing history (shows loading loop but does nothing) despite disabling and removing the 3rd party extensions. I have come up with a solution which will not only fix this issue but will make your Google Chrome experience faster. Go to bookmark manager, click Organize and Export Bookmarks to HTML file. Go to Start Menu, Open Control Panel and click Programs and Features. Find Google Chrome from the list and click Uninstall. It will give you an option to Clear Browsing Data, make sure it is checked/selected then click Uninstall. Delete Chrome folder permanently by pressing SHIFT+DEL key. Now that you have removed Chrome completely, it is time to install a fresh copy of it. Go to Google Chrome website and download the latest version and run the installer. It will take couple of minutes depending on your Internet connection speed. Once the installation is completed, import your Bookmark backups and Extensions. You will notice an improvement in overall browsing experience, also you will see that it now takes a few seconds to Clear Browsing History/Data from the beginning.